KUCHING: The lack of education and a naive attitude on personal finances are the two chief causes that drive individuals deep into debts. Credit Counselling and Debt Management Agency (AKPK) CEO Koid Swee Lian yesterday said that the level of financial education in the country was still relatively low compared to other Asian countries like Taiwan where 89 per cent of credit card users make full payment for credit card bills. “In Malaysia, less than 50 per cent makes full payment, 18 per cent pays only the minimum amount and 15 per cent pays more than the minimum amount,” she said. “The reason why most Taiwanese make full payment of credit card bills is because they are very well educated and aware on finances and they are aware of the various charges and fees banks make. Most financial institutions even go to Taiwan to test new products because the people there are always in-the-know on finances,” Koid added in a media briefing at APKP Sarawak branch at the Bank Negara near Satok. AKPK Sarawak head Marlene Margaret Nichol was also present. To promote financial knowledge, basic money management skills and responsible credit use, AKPK has set up public briefings, financial management counselling, AKPK ‘Power!’ programme and Debt Management Programme (DMP). Koid said that under DMP, counsellors can assist borrowers in high debt to manage their repayments in an affordable amount. 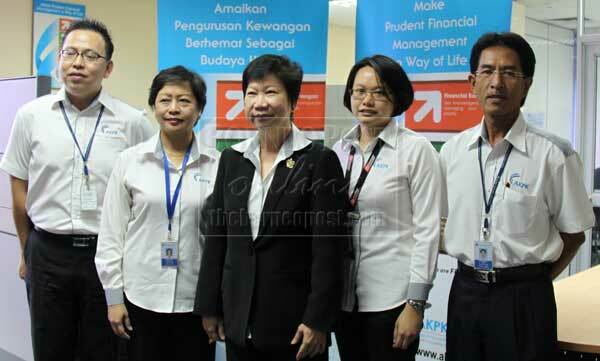 “With AKPK, nearly 80,000 individuals in Malaysia avoided bankruptcy. If you have debts, don’t run away from your debts or resort to ‘ah longs’ instead seek free and professional financial advice and guidance from AKPK. Our counsellors in the DMP can assist in negotiating with bankers for an affordable repayment so that both lenders and borrowers can benefit from it,” she said. In Kuching, a total of 5,310 have undergone counselling with AKPK since they started in October 2006 and out of that number, 2,730 have enrolled under DMP. For Miri and Sibu, 651 and 462 have undergone counselling with AKPK. “For the whole of Malaysia, 198,870 have undergone counselling with AKPK as of Sept 30 this year while 81,596 enrolled in DMP,” Koid said. AKPK Sarawak conducts free, walk-in public briefings every Wednesday at 2.30pm and Friday at 10am at its branch office. Their AKPK ‘Power!’ programme is held every Wednesday from 9am to 1pm. Those interested in the AKPK ‘Power!’ programme are urged to register with the branch and a certificate will be given to those who have completed the programme. “Those who have the AKPK ‘Power!’ programme certificate should keep it because it can be very useful when applying for loans. Bankers will have higher confidence on those who have taken the initiative to educate themselves financially,” Koid added. The AKPK ‘Power!’ programme is also available online at power.akpk.org.my/. AKPK Sarawak is located at Bangunan Bank Negara Malaysia, Jalan Satok. They can be contacted at 082-414910 or fax 082-414960 from Monday to Friday from 8.30 am to 5.30pm.